Several brush and forest fires broke out in central-southern mainland Greece (Attica, Central Greece and Peloponnese Regions) and Crete Island on 23 July 2018. Two major fires were positioned in western Attica (Kineta) and eastern Attica (Penteli), the distance between them being just 35 miles (65 km). A combination of a dry winter and a hot summer where temperatures have risen above 40C are said to have created tinderbox conditions. The origin of the fires is human, most probably arson, albeit the authors remain unknown. Powerful, hot winds which were up to 124 km/h, 77 mph, 12 Beaufort, speeded the flames. The fire in Kineta burned dozens of houses in the area, while the fire in Penteli headed east towards the beach, where it started burning parts of the municipalities of Neos Voutzas and Mati. Mati - located in the Rafina region, 18 miles north east of Athens - is a popular resort for Greek and foreign holidaymakers, particularly pensioners and children at camps. There is no compact forest in Mati, only hotels, houses and villas with gardens surrounded by scattered pine trees. Mati is an example of unlicensed building dotting the Greek landscape, developed in recent years and tolerated by the state, as successive 'democratic" governments - to win votes - turned a blind eye to non-compliance and legalized illegally built homes in former natural areas converted without adequate urban planning into residential areas. Mati was devastated by a blaze that started at about 5pm local time on Monday 23.07.2018. Favored by highly inflammable pine trees and accumulated dry shrub, the fire burned through 5 kilometers (3.1 miles) in just 90 minutes in a densely populated zone where 20,000 people were present. The blazes scorched 17,000 acres (6,880 hectares) of residential areas, 98 percent of which was destroyed. More than 1.000 buildings were completely burnt or severely damaged. Dramatic video footage showed people fleeing by cars channeled towards a secondary route towards the sea as the police cut the main highway in the vain hope to use it as a barrier to the fire. This proved to be a fatal error as the fire jumped over the highway and dozens of cars were stuck and charred in the narrow streets of Mati, several of which had no issue. Many people were trapped and burnt alive, as devastating flames and thick smog made impossible access to the shore. The lucky ones waited rescue for several hours swimming in the sea. 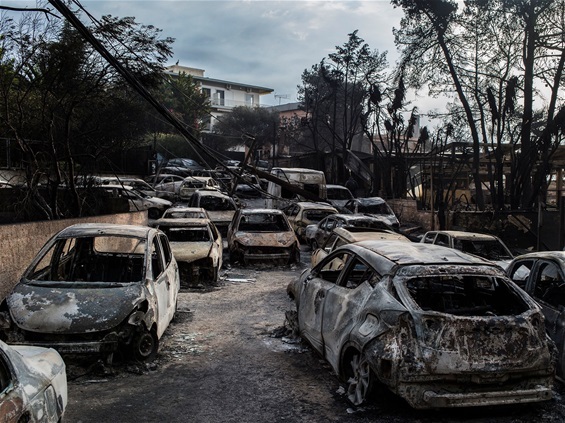 While not covering as much ground as the devastating 2007 fires, which mostly roared through swaths of the Peloponnese and killed 84 people, this year’s wildfires in Attica were the worst in the country’s and Europe's history. The Attica wildfires were the second-deadliest wildfire to occur worldwide since 2001, after the 2009 "Black Saturday" bushfires in Australia that killed 180 people. Despite the imminent fire danger (extreme summer heat and very strong winds), the Greek fire department wasn’t on alert and there wasn’t either any attempt to warn the people and evacuate the area. Prime Minister Alexis Tsipras’ Radical Left SYRIZA-led coalition has come in for heavy criticism for its shortcomings in handling of the disaster and complaints about appointments of incompetent officials in key positions on political grounds. On Monday night, five hours after the fire in Mati had started, state TV showed Tsipras rushing from the airport (back from a visit to Bosnia !) to an operations center in Athens, asking ministers in a live broadcast what happened and how many personnel had been deployed to put out the flames. He did not ask nor was he told anything about fatalities in Mati, where dozens were trapped by advancing flames and died. At least not on camera. After announcing three days of national mourning later that day, the leftist PM Tsipras was invisible until Friday. He is not known to have visited any of the survivors in hospital. Tsipras appeared on TV screens again on Friday to chair a cabinet meeting after the official three days of mourning ended. To justify his absence, his office said in a statement that he had been busy coordinating the disaster response ! A week after the killer blaze ripped through Mati, the leftist premier spent around an hour in the area in an incognito visit without the presence of mass communication media and press reporters. This was done to avoid heated debates with the surviving residents of the area who had shouted at Tsipras’ coalition partner, Defence Minister Kammenos, when he dared to visit the Mati burnt area a few days ago. Venting anger, survivors and political opponents want to see SYRIZA politicians and officials resign over the failure to prevent the disaster amid questions on why an evacuation did not take place. A deputy mayor in Marathon, which administers some of the affected area, on Saturday became the first official to resign over the wildfire. Mr Tsipras said he accepts "full political responsibility" for the disaster as opposition leaders claimed the government had failed to adequately safeguard human lives. But for those who survived the inferno, the politicians' words meant little. “Words are nice … but I want him to tell me and the people who perished, our friends … whose fault it is, if not his. I’ve reached my limits”, a resident of Mati said to the press. Moreover, the premier's self-admitted "full political responsibility" for his administration shortcomings in the Mati wildfire remained a pure verbal declaration, which was not followed by any sanction against officials or politicians who evidently committed errors or a government resign as foreseen by Constitution. However, the authorities could be liable for criminal charges such as involuntary manslaughter, bodily harm, exposure that led to death and arson in what the surviving victims call a "biblical catastrophe," according to the text of the lawsuit seen by Reuters. The relatives of a woman and a man killed in the Mati wildfire have sued state authorities, the fire brigade and police over their deaths. A prosecutor is now investigating the cause of the wildfire and the role of authorities in responding to the blaze. The crucial question is how far this investigation would be allowed to go, the answer to which will depend on the grade of independence of Greek justice from the political establishment. The European Union activated its Civil Protection Mechanism after Greece sought help. Several countries said they were sending aircraft to help fight the flames. The EU Commissioner for Humanitarian Aid and Crisis Management, Cypriot Christos Stylianides, said climate change was one of the reasons for the Greek fires, as well as others around Europe, but he delicately hinted that the Greek government was at fault too. “To have so many casualties from a fire of such limited size may indicate shortcomings in prevention and preparedness…” he said in diplomatic language. Environmental groups, including the "World Wildlife Fund" (WWF) and "Greenpeace", said that Mati fire shows the full inadequacy and ineffectiveness of the current forest protection system in Greece. 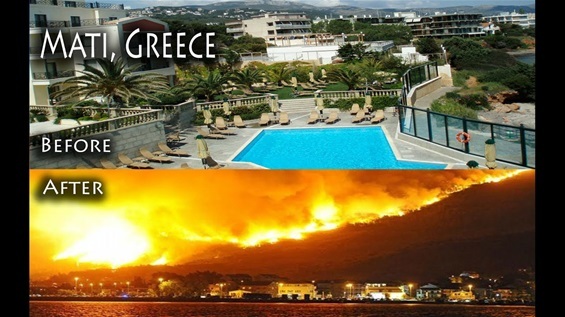 The Mati wildfire laid bare grave ills of the Republic of Greece, namely the inexistence of an efficient forest protection and fire prevention policy, aggravated by the blatant incompetence of SYRIZA politicians and officials to handle situations of crisis. Important EU credits and know-how for forest protection and fire prevention, available to Greece through EU Regulations and Funds, have not been used by corrupted politicians and incompetent administrations. 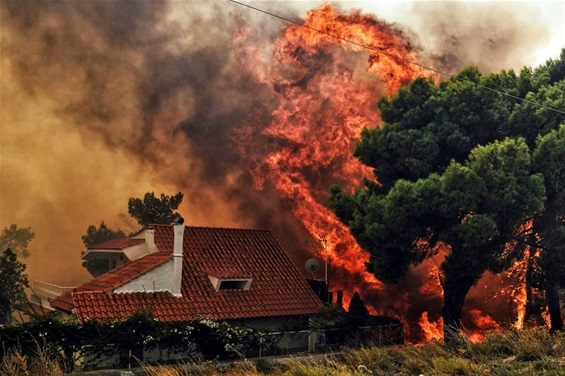 The leftist SYRIZA government has announced relief measures for the wildfires victims, some of which - such as free attendance of ancient tragedies played at the Epidaurus theater and the prolongation of the deadline to submit tax payment declarations for due revenue and property tax for this year - caused additional public anger. There is now a wide public conscience that since they gained power 3,5 years ago, Tsipras and his Radical Left SYRIZA-led coalition have only caused disasters to Greece: social, economic, financial, national and now natural disasters. 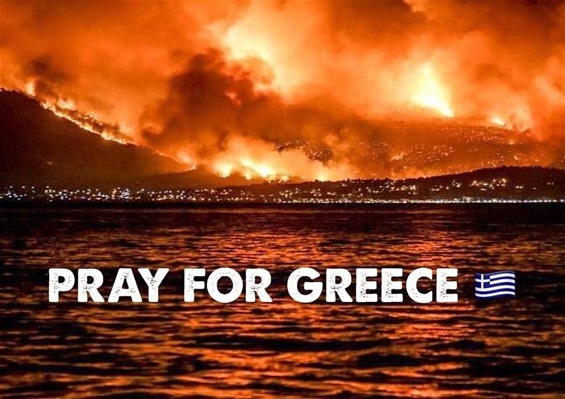 Greeks were expected to gather outside Parliament to light candles in memory of those who lost their lives in Mati. However, they would serve their country better, if they would rush Instead inside the Parliament, depose the disastrous SYRIZA Government and call back the king. Such a brave action would also invalid the recent Tsipras-Zaev disastrous agreement and save Greek Macedonia ! There is no forest in Mati, a holiday resort developed in recent years on former natural areas, mostly without compliance to modern urban planning rules. Cars trapped and burnt in the narrow streets of Mati. 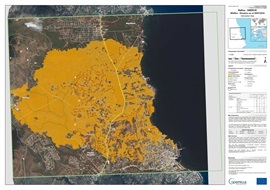 Mati: Before and after the 23.07.2018 wildfire. 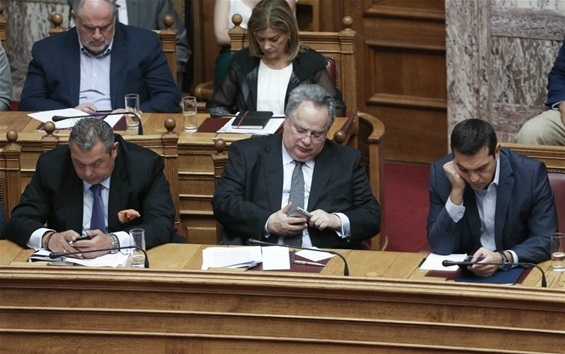 Left to right: the trio Kammenos-Kotzias-Tsipras in Parliament; the alliance of traitors on the verge of collapse..